Wildlands and Smart Growth programs are implemented through state and federal government agency directives. The Wildlands programs use government regulations to wrest control of rural lands away from private property owners. Smart Growth is a term used to describe high density commercial and residential development built within walking distance to rails and work. You will find similar programs developing in your community. It is not just property owners that are under attack. It is also your safety and freedom that is at stake. Despite the advanced stage of the local Sustainable Development takeover, Santa Cruz forest owners are winning their court battle over confiscatory zoning ordinances. In addition to that battle they — and others — must prepare to defend against the following Sustainable Development attacks on Santa Cruz County (a partial list). The U.S. Department of Interior is attempting to create a county-wide Habitat Conservation Plan (HCP) through local fire agencies. The HCP is a regulatory program that mandates private property owners manage their land pursuant to single species protection at the expense of ecological diversity, productivity and human liberty. This system of regulations could keep landowners from being able to prevent fire hazards and also prevent them from walking on their own property. HCP implementation had been thwarted in 2002 by private citizens but the plan is now being re-launched, bundled within the adoption of an international fire code (Urban Wildlands Intermix Code – UWIC) disguised as a local ordinance. Within the U.S. Department of Agriculture, a web of Best Management Practices are being implemented by the local Resource Conservation District, in coordination with the local Farm Bureau and others. The program leads to the implementation of a new regulatory process for rural and agricultural activities. The system will operate under the principle of voluntary compliance — manage land the government’s way, or else! The U.S. Department of Commerce’s Monterey Bay National Marine Sanctuary is a massive, mountain- ridge to shoreline, land use regulatory program designed to “protect the ocean”. The scope of this set of growing regulations is limitless. For instance, urban runoff from kitty litter is considered a threat to the Sanctuary. Over twenty different agencies partner to enforce sanctuary regulations with fines of up to $119,000 per violation. $5 million dollars has been allocated to a local federal employee of the U.S. Department of Agriculture so that he can hand out money to battered (over-regulated) farmers in exchange for conservation agreements and easements. Conservation Easements vest future management control of the farmlands into the hands of government or its partnering “non-profit” farm organizations like Agri-Culture. 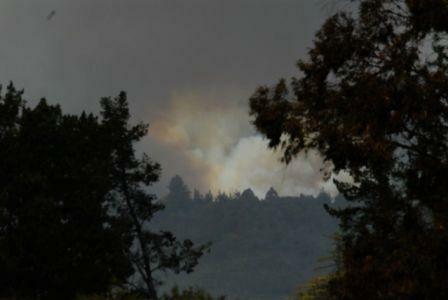 The Central Coast Regional Water Quality Control Board now has veto authority over timber harvest plan approvals. Recent California legislation gives this board the ability to impose an unlimited water data collection fee. The tax has been designed to be as high as 70% of the timber yield. The Central Coast Regional Water Quality Control Board is also mapping agricultural land, with farm bureau cooperation, for purposes of designing agricultural irrigation permit requirements. This program would steal the farmer’s genuine ownership in the water drawn from his well and place it into state control, thus subjecting the farmer to government control of his land management. The purpose of this regulatory infringement on farmers is to gain state control over water use, crop selection, crop rotation and most other farm management decisions. The Pajaro Valley Water Management Agency has imposed an enormous illegal tax, collecting tens of millions of dollars from local farmers for use of their own privately produced water. Some courageous farmers have initiated a major legal undertaking to nullify the tax. Local farmland is threatened with the prospect of a federal water pipeline coming to our rain-abundant county. When compounded with new state laws, the farmers’ groundwater may then be subject to conjunctive use rules that are intended to merge ground water with surface water regulation. The result would be a loss to the farmer of his California constitutional right to the well head water that the farmer pumped.When the farmers say ‘so long to our water rights’, Americans can look forward to food grown on state-managed, centrally-controlled and collectivized farms. There will be increasingly fewer choices – and real and manipulated shortages. Remember Sustainable Development views American production as “unsustainable”. 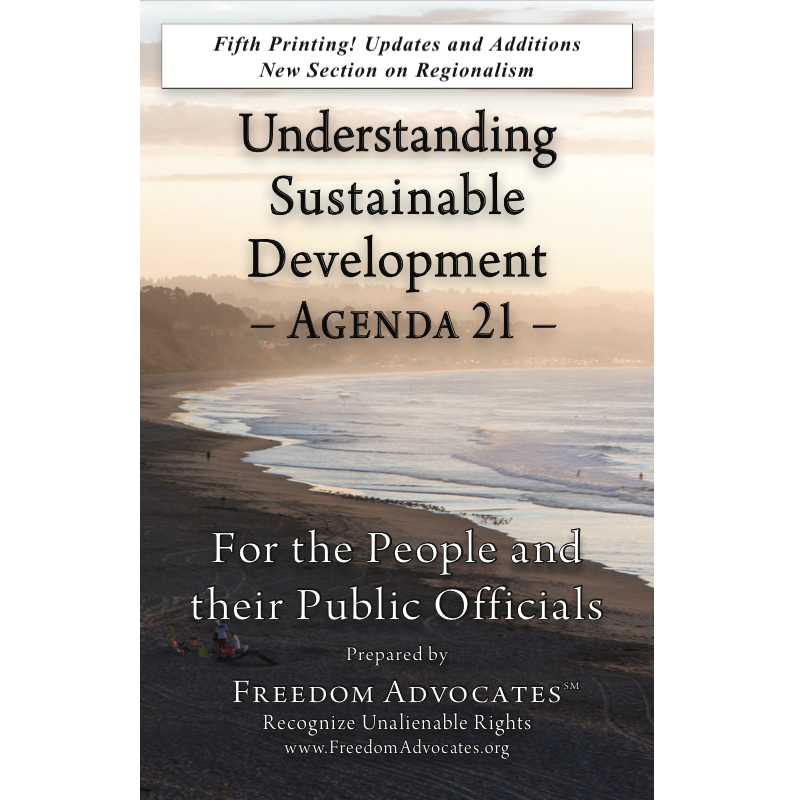 Sustainable Development, in its own words, seeks to destroy America’s middle class. A smart growth housing element has been drafted and is being reviewed by the California State Department of Housing and Community Development. The proposed draft restricts use and limits basic services to many rural areas. The plan also seeks to place approximately 10,000 government-controlled housing units within walking distance of an impractical rail line. After a 4-1 vote, the Santa Cruz County Board of Supervisors gave perfunctory legislative approval to the draft. The local paper reported initial government “grants” of $295 million in order to subsidize the first 3,700 of these “affordable” coastal projects. Language in the county’s draft housing element encourages and provides incentives for these government controlled units to be built by government’s “partners”. (If an individual wanted to build a single-family house in the county it could take years and perhaps $100,000 in government fees. )Government-imposed conditions to housing may include restrictions on auto ownership or auto use and compliance to future edicts regarding acceptance of water and energy “masters” who would possess unilateral authority to restrict an occupant’s ration of water and power. The so-called owners of many of these units will not be allowed to obtain market equity. Housing occupants will be chosen by a government Housing Authority. The majority of Supervisors on the County Board appear to presume that the lure of the subsidized rents and controlled prices (with beaches as a bonus) will expand their voter base. This will allow them to usher in water and power rations on suburban homes and increased tax assessments on suburban homeowners. Under Sustainable Development principles, suburban, single family homes are not “sustainable”Housing will be collectivized under Sustainable Development. Consumer-driven and morally-financed new housing development is close to dead in Santa Cruz. Hundreds of “non vacant — underutilized” private property parcels have been identified by the Santa Cruz County Planning Department for future densification by government-selected Smart Growth builder “partners”. Selected single family home owners on this list will be harassed and replaced or forced to comply. 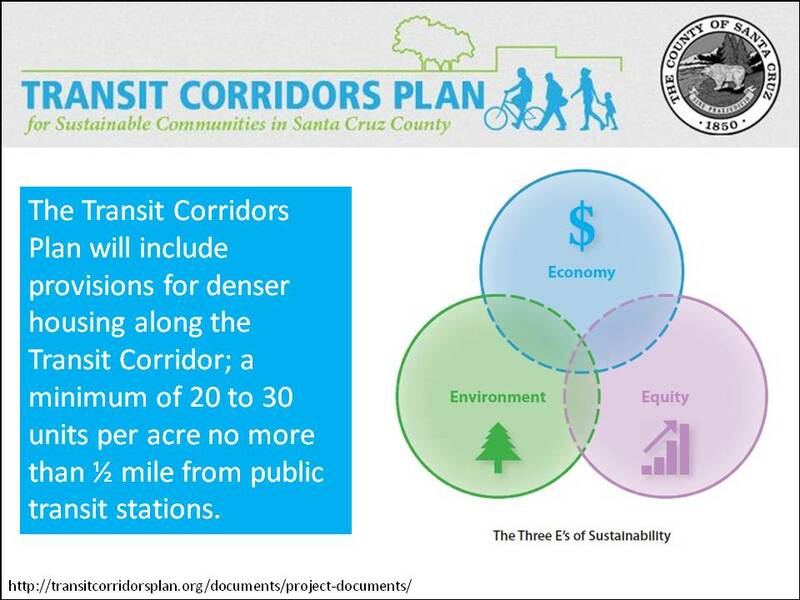 County and regional plans, state grants, federal funds and taxes are being prepared for the creation of a two-county (Monterey and Santa Cruz) “passenger rail line“. Auto transportation has been deemed by the transportation authority as “behavior” that should be “modified”. Accordingly, auto mobility is being made increasingly difficult. The Rio Accords were signed by then-President George H.W. Bush. Sustainable Development has been the official policy of all federal agencies since 1993, when President Clinton created the President’s Council on Sustainable Development (PCSD).